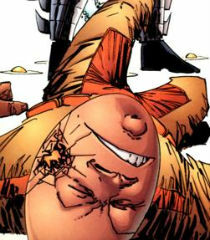 Egg-Noggin is one of the more lame freaks to try and establish himself as a villain, managing to be defeated by an incarnation of the Deadly Duo that consisted of Kill-Cat and Bubble Boy. This defeat and presumably other feelings of inadequacy were part of the reason that Egg-Noggin later volunteered for the Dragon Army experiments. OverLord III had a group of his Vicious Circle members injected with a serum created from Dragon’s blood that augmented the their powers to be Dragon-like; thus creating a Dragon Army. At this point Dragon had reverted to his original persona of Emperor Kurr and was disgusted that others had stolen and used his blood. He confronted the Dragon Army, including Egg-Noggin, and massacred them for their crime.